Student Achievement at LCAD is multifaceted. It is the foundation of every aspect of learning. To measure it, we consider the multidimensional way in which our students learn, and evaluate our students’ accomplishments in every area. In accordance with our mission, “to prepare students for careers as creative artists, designers and writers…”, one measure of achievement is through career placement of our graduates. To assess achievement of learning, we evaluate how well students perform in different categories depending on their academic program. 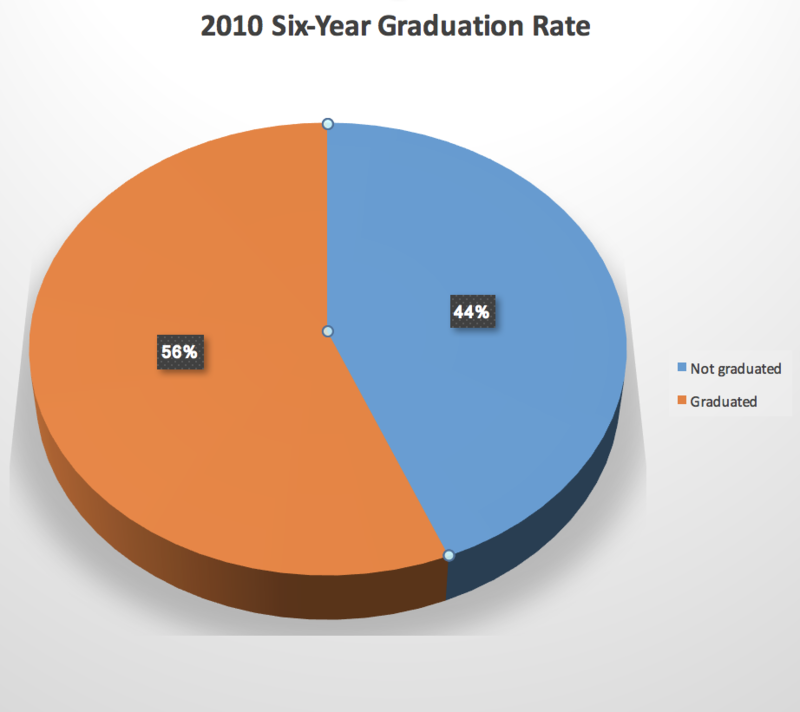 To assess overall academic achievement, we evaluate graduation and retention rates. Student achievement can’t fully be measured without understanding the student experience from their own perspective, and of course by evaluating their work. This integrated approach allows us to measure what students know, as well as what they can do with what they know. This site shares the story of student achievement at LCAD. LCAD has established institutional learning outcomes (ILOs), reflective of campus-wide learning, that define the desired outcomes for all graduates regardless of the program they are enrolled in. 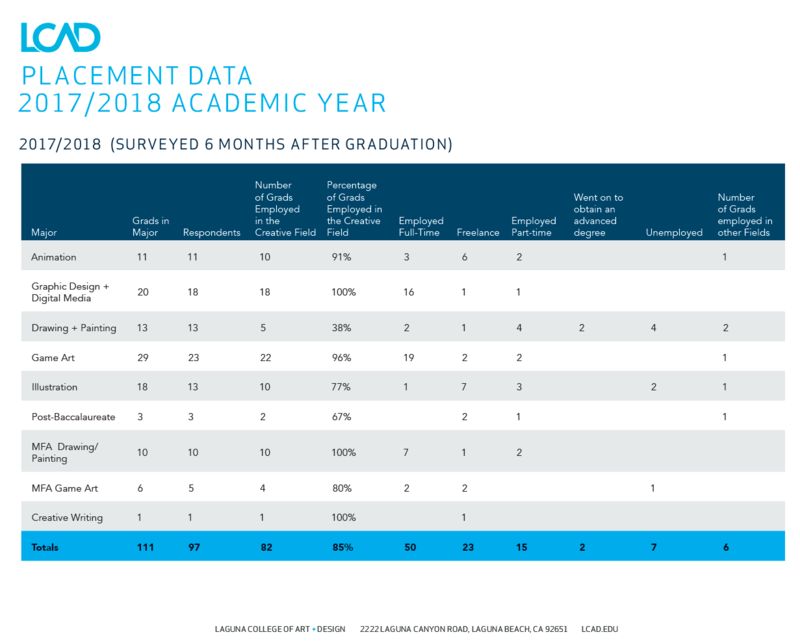 These are aligned with program level outcomes which define what graduates of each specific academic program are able to do when they complete their studies. This allows faculty and students to have a shared understanding of the meaning of the degrees and of what graduates are expected to know and do at the end of their course of study. Written Communication—Graduates are able to demonstrate a command of fundamental writing principals to communicate clear and complex thoughts using standard written English. Information Literacy – Graduates are able to effectively access, analyze, and use information from reliable outside sources in order to build knowledge and understanding in the approach to diverse issues and problems. Oral Communication—Graduates are able to deliver clear, coherent oral presentations effective in communicating rich understanding of a given topic. Critical Thinking—Graduates are able to analyze different points of view, discerning value within opinions with which they disagree, and arriving at multiple solutions to problems. Quantitative Reasoning—Graduates will be able to utilize quantitative information in a variety of forms in order to draw conclusions and solve problems. Creativity– Graduates can demonstrate diversity in their creative productions by generating applications of their acquired knowledge through the thoughtful planning and designing of visual solutions. Technical Skill Expertise—Ability to create within and through discipline-specific media, purposefully applying technical skill and historical context. The assessment of student learning and educational effectiveness is designed to ensure that all assessment activities stem directly from the institutional learning outcomes. This is demonstrated through the articulation of program learning outcomes (PLOs) for all degree programs. Program level assessment, reflective of program and course level learning, is completed annually. The assessment of PLOs includes faculty participation in evaluating learning outcomes. This evaluation is completed using mapping, as well as through direct assessment measures. In order to facilitate the reflective aspect of teaching and learning and to facilitate ongoing academic assessment at the college, each year, all academic departments are asked to submit a report of direct assessment for at least one program learning outcome (PLO) for each academic major offered. Conducting regular direct assessment of learning helps in program planning and supports the program review process. Co-curricular activities are those activities, which are not a part of the formal curricula that complement the development of student skills. Results are utilized to improve the student experience through enriched opportunities for engagement and learning outside the formal classroom. Co-curricular activities include counseling services, career services workshops, library activities, labs, student orientation, student life activities and our LCAD gallery. Data collection for co-curricular activities occurs in accordance with the delivery of each activity. Assessment reports for each activity are developed each year by the respective activity leader. This report presents findings from the immediate activity, as well as provides comparative data of offerings across time. The report describes the use or intended use of findings in the form of recommendations and action steps. The program review process relies heavily on the results of institutional inquiry and self-reflection, research, and data collection to make informed decisions on program and curricular improvements. By stimulating program planning and encouraging strategic development, program reviews can be a central mechanism to advance the college mission and plan for academic enrichment. All academic programs offered by the college are subject to systematic program review. The program review process includes, but is not limited to, analyses of student achievement of the program’s learning outcomes; retention, graduation and placement rates; and evidence from external constituencies such as employers. Program reviews are to include input from multiple stakeholders including students, alumni, faculty and external reviewers. This process is assessed annually by the Assessment Committee. Improvements are made based on data collected from the previous review. 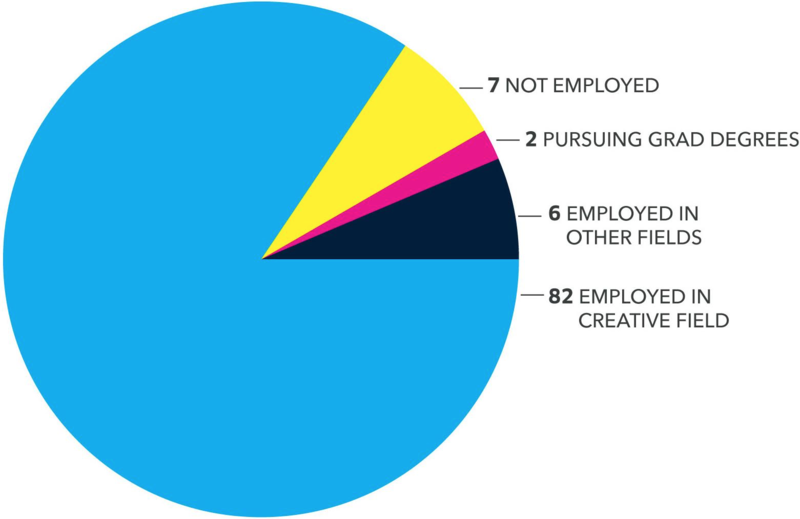 The following data was collected by the Career Services department on LCAD graduates from the 2017-2018 academic year. 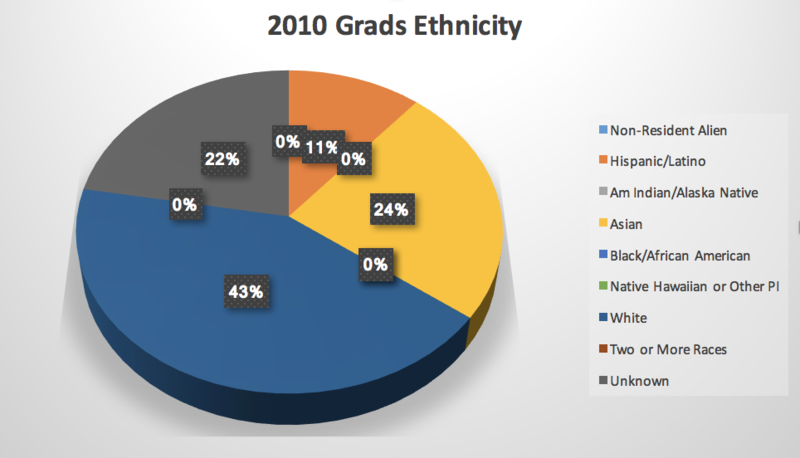 The data was collected six months after graduation from 97 out of 111 graduates (87% of graduates). Satisfaction data is collected through the use of student surveys. In May of 2017 the Office of Assessment sent a survey to all current freshmen, sophomores and juniors to collect indirect data on student satisfaction. The survey consisted of Likert scale, multiple choice, and matrix style questions that detailed students’ experience with LCAD services. The survey was created with input from the Assessment Committee. 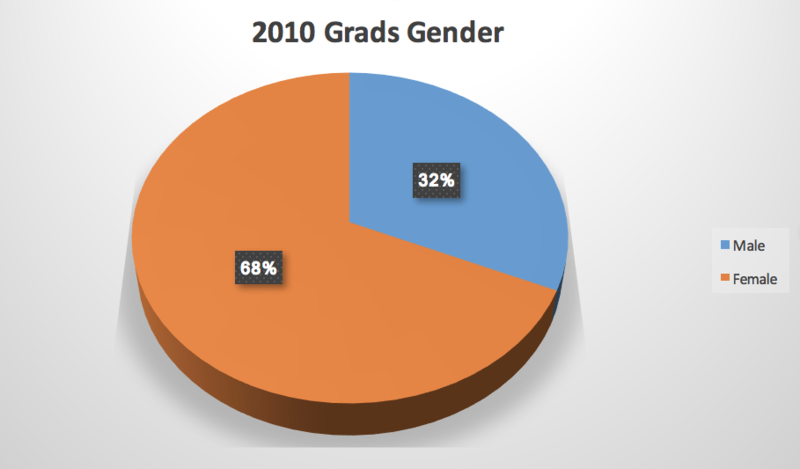 The overall response rate was 35.60% (N=183) of 514 students surveyed. 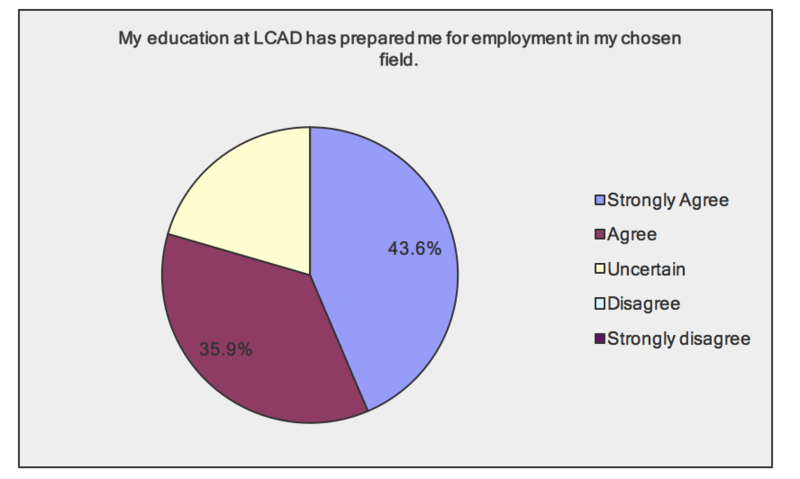 The following shows the results of students’ satisfaction with LCAD. In May of 2017 an exit survey was sent to all graduating seniors. The survey consisted of Likert scale, multiple choice, and matrix style questions that detailed students’ experience and future. 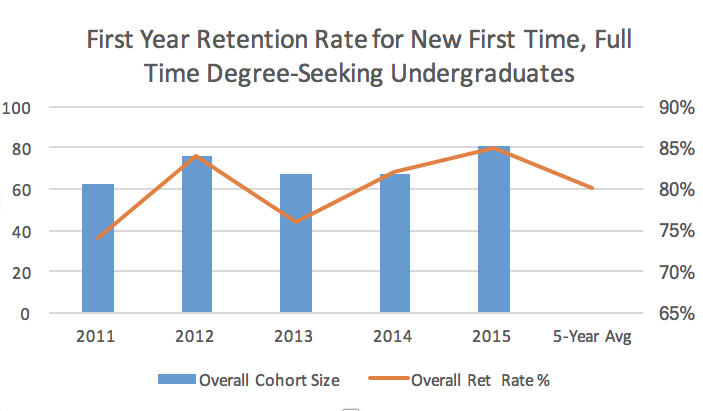 The overall response rate was 35.43% (N=45) of 127 graduating seniors. The following shows the results of students’ perception of how well their education prepared them for employment in their chosen field of study.